This practical guide is the first to take a behavioral/managerial approach to one of the fastest-growing fields in marketing: services marketing! 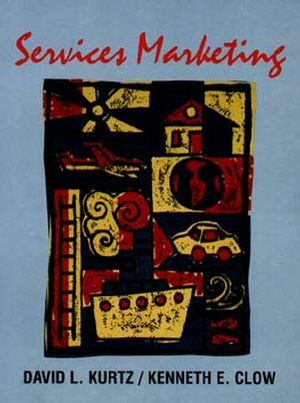 In an engaging and interesting writing style, the authors present the latest theories and concepts of both domestic and international services marketing, all within the context of how theory is applied in today's dynamic environment. David L. Kurtz is currently the R.A. and Vivian Young Chair of Business Administration at the University of Arkansas. Kurtz has previously held appointments at Seattle University, Eastern Michigan University, Davis & Elkins College, and Monash University (Australia). He is the author of 30 books and over 100 articles and papers. Kenneth E. Clow is currently an associate professor of marketing at Pittsburg State University. He has written over 60 journal and proceedings articles, most of which are in the services marketing field. In addition he owned and operated a service business for eight years. A full complement of pedagogical aids. Each chapter includes chapter objectives, boxed illustration files, a summary of chapter objectives, review questions, discussion and critical thinking exercises, an opportunity for students to access the Internet, a glossary of key terms, and a short case with questions designed to elicit critical thinking on the part of students. A behavioral, managerial approach to the study of services marketing that is relevant to today's business environment. Coverage of both domestic and international services marketing. The text has many cases: thirteen end-of-chapter cases with discussion questions and eight comprehensive cases requiring students to integrate multiple concepts and theories.